In recent weeks, if you’ve tried taking your dog for a walk, cutting the grass, or simply grilling out, you know how bad they are! Recently, the City of Milwaukee Health Department confirmed the first likely case of West Nile virus this year. Symptoms of the virus can begin three to fifteen days after being bitten by an infected mosquito. Currently, there’s no cure for West Nile virus, only treatment for symptoms. If you think you’re infected with the virus, contact your healthcare provider immediately. There are still plenty of nice days to enjoy. Here are some reminders on how to protect your family from these annoying insects throughout the fall season. 1. Limit outdoor activity. Mosquitos are most active at dusk and dawn. 2. Use insect repellent. The Centers for Disease Control and Prevention (CDC) recommends using insect repellants that contain one of the active ingredients below. To find a repellent that’s right for you and your family, click here. Remember to apply every few hours for maximum protection. Quite honestly, the mosquitos are so bad right now; I’m going to buy a repellent with DEET for my family. I’m also going to look for a spray to treat my house door as well. Mosquitos are just sticking to it. Every time I open the door, they fly right in. I find there’s nothing worse than a mosquito buzzing around my head at night while I’m trying to sleep. Please note; the repellents mentioned above are effective for human use only! They shouldn’t be used on pets. If you’re a pet owner, contact your veterinarian or pet store for safe product recommendations. 3. Protect your house indoors and out. 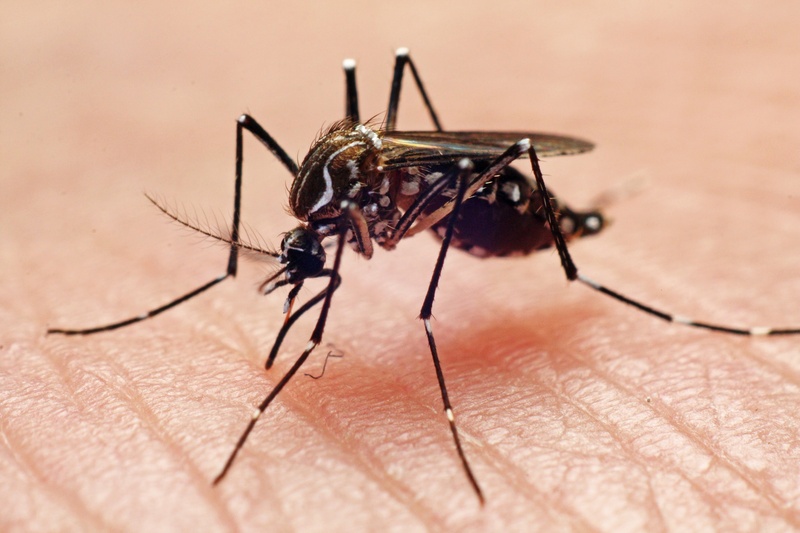 Since mosquitos can transmit disease, it’s important to protect your home as well! Use knockdown spray. If you see mosquitos flying around in your home, consider using a knockdown spray. It may be easier than chasing them around with a fly swatter. Spray also avoids splattering them on your wall. If you have pets or small children, read the warning label before spraying. Plug in the bug zappers. Back in the day, my parents were innovative with the outdoor bug zapper. From what I’ve seen lately at friends’ homes, they’re making a comeback. Identify areas that could be a breeding ground. Remove standing water inside and out. On a weekly basis, change the water in your birdbaths, pet’s water dish, and vases. If you have rainwater barrels, make sure they’re sealed tightly. Inspect your screens. Make sure your screens are in good condition. Look for tears or holes in screens that protect your doors, windows, exterior vents, and chimneys. Keep a beautifully manicured yard. Mowing your grass and trimming tall weeds on a regular basis can prevent mosquitos from finding a place to hang out. Consider spraying your yard. If you’re unable to enjoy your deck or patio, look into treatment options. Mosquitos like to relax in dark, humid areas around your home. 4. Protect your newborn. If you’re a new parent or grandparent, congratulations! Please avoid using insect repellent on babies younger than two months old. Better alternatives include, clothing that covers their arms and legs and mosquito netting for their carriers and strollers. 5. Wear long-sleeved shirts and pants. With the nice warm temperatures we’ve had, and cooler temperatures around the corner shorts and flip-flops may be desirable apparel. However, long sleeved-shirts and pants can help protect you from unwanted bites and frustration. It makes standing at the grill a little bit warmer, but it’s worth it. Since not all mosquitos are the same, here is some additional information from the CDC about protection. When the fall wasps return, check out my blog “Five tips to deal with crazy fall wasps”. Do you have any tips you’d like to share? I’d love to hear them. Please share them in the box below.